Manjunath Akki Professor, Dept. of Panchakarma, Shree Jagdguru Gavisiddeshwara Ayurvedic Medical College, Koppal, Karnataka, INDIA. Snigdha Rani Patra Post Graduate Scholar, Dept. of Panchakarma, Shree Jagdguru Gavisiddeshwara Ayurvedic Medical College, Koppal, Karnataka, INDIA. Carpal tunnel syndrome is a common condition that causes pain, numbness and tingling in the hand and arm. The condition occurs when one of the major nerves of the hand, the median nerve is squeezed or compressed as it travels through the wrist. In most patients, carpal tunnel syndrome gets worsen over time, so early diagnosis and treatment are important. If CTS (carpal tunnel syndrome) left untreated, symptoms can last a long time and get worsen. Carpal tunnel syndrome cannot be compared directly to any of the disease in Ayurveda. But to some extend we can compare CTS to Jhinjhini Vata described in Chakradatta. And in later stage when CTS is left untreated the pain and numbness radiates from hand to forearm and arm, at that stage we can compared it with Vishwachi (Brachial neuralgia). HAKKANDI, Suresh N.; AKKI, Manjunath; PATRA, Snigdha Rani. ROLE OF PANCHAKARMA IN THE MANAGEMENT OF CARPAL TUNNEL SYNDROME - A REVIEW. 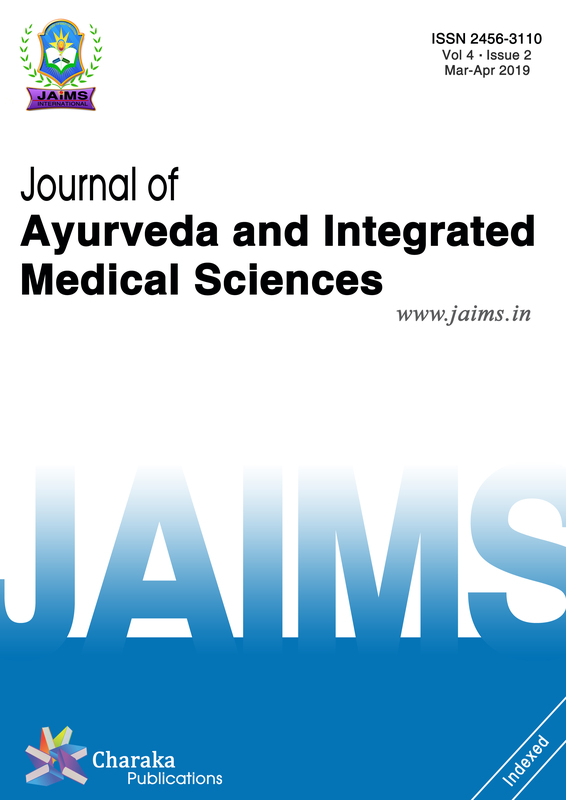 Journal of Ayurveda and Integrated Medical Sciences (ISSN 2456-3110), http://www.jaims.in/index.php/jaims/pages/view/Citation, v. 3, n. 5, p. 184 - 186, nov. 2018. ISSN 2456-3110. Available at: <https://jaims.in/index.php/jaims/article/view/710>. Date accessed: 25 apr. 2019. doi: https://doi.org/10.21760/jaims.v3i5.13841.